Inside the compact mic are two 16mm condenser capsules which offer "warmth and clarity with a smooth, accurate frequency response." There are three polar patterns including cardioid (unidirectional), bidirectional and omnidirectional pickups. It delivers 24-bit/96kHz "studio-quality" sound, and has what the company calls a "smooth, flat frequency response of 20Hz-20kHz." In the box is both a USB and a Lightning cable to connect to either a Mac/PC or an iPhone. If you supply your own micro USB to USB-C cable, it will also work with the latest iPad Pros. The body is made of durable aluminum with a stainless steel mesh grille to stand up to any beatings it takes on the go. 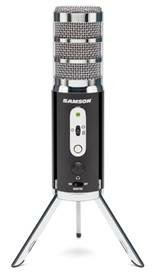 Samson's Satellite Broadcast Microphone will be available in May for $99. AppleInsider previously checked out the Blue Raspberry portable mic that connected to iPhones and iPads over Lightning but it lacks the polar patterns found on the Satellite Broadcast Microphone from Samson.